This paper examines logic and evidence bearing on the efficacy of fiscal policy in severely depressed economies. In normal times central banks offset the effects of fiscal policy. This keeps the policy-relevant multiplier near zero. It leaves no space for expansionary fiscal policy as a stabilization policy tool. But when interest rates are constrained by the zero nominal lower bound, discretionary fiscal policy can be highly efficacious as a stabilization policy tool. Indeed, under what we defend as plausible assumptions of temporary expansionary fiscal policies may well reduce long-run debt-financing burdens. These conclusions derive from even modest assumptions about impact multiplier, hysteresis effects, the negative impact of expansionary fiscal policy on real interest rates, and from recognition of the impact of interest rates below growth rates on the evolution of debt-GDP ratios. While our analysis underscores the importance of governments pursuing sustainable long run fiscal policies, it suggests the need for considerable caution regarding the pace of fiscal consolidation in depressed economies where interest rates are constrained by a zero lower bound. “The G20 in Retrospect and Prospect, “ By Matthew J. Schoenfeld and Lawrence Summers, June 2012. “International Financial Crises: Causes, Prevention, and Cures,“ American Economic Association Papers and Proceedings, Richard T. Ely Lecture, May 2000. “Reflections on Managing Global Integration,” Journal of Economic Perspectives, Spring 1999. 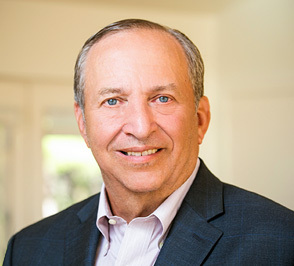 For a historical list of publications by Lawrence H. Summers, including books and articles, please see CV.